I love the elegant shimmer of this base coat. I've been crazy sick, which is the excuse I'm using for my can't-give-a-crap about the stray polish messiness in this photo. 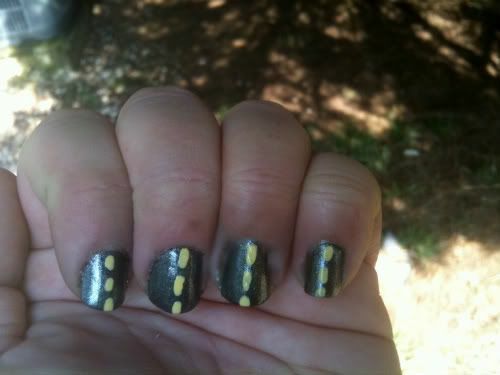 That's right, this is a nail art and excuses blog! I really don't have too much to say because I'm feeling kind of lousy, but I guess Hethert is who I want around when I'm not feeling great. 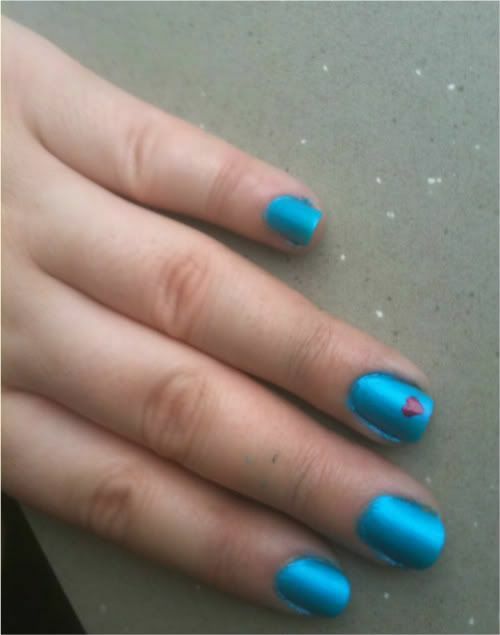 Fun fact: I don't have my brushes with me, so I did the heart with the tine of a plastic fork. That was annoying. So the poor photography will continue for the time being, seeing as I apparently needed to order a new battery charger for my camera. 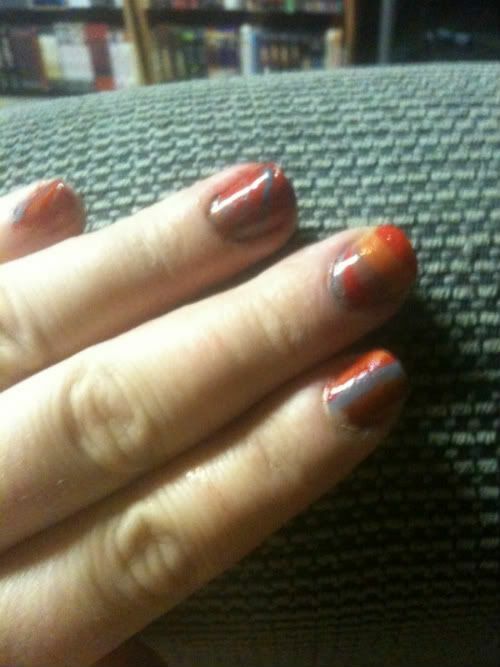 For Set, I decided to try my hand at water marbling. Given my limited artistic skills, it felt like the best way to achieve the chaos I was going for. I'm not sure if I really achieved what I was going for, but my intention was a confusing swirl of blood, smoke and rust -- arbitrary and temporary. I'm not good at being profound, so I'll stop making words happen. Catch you next time! 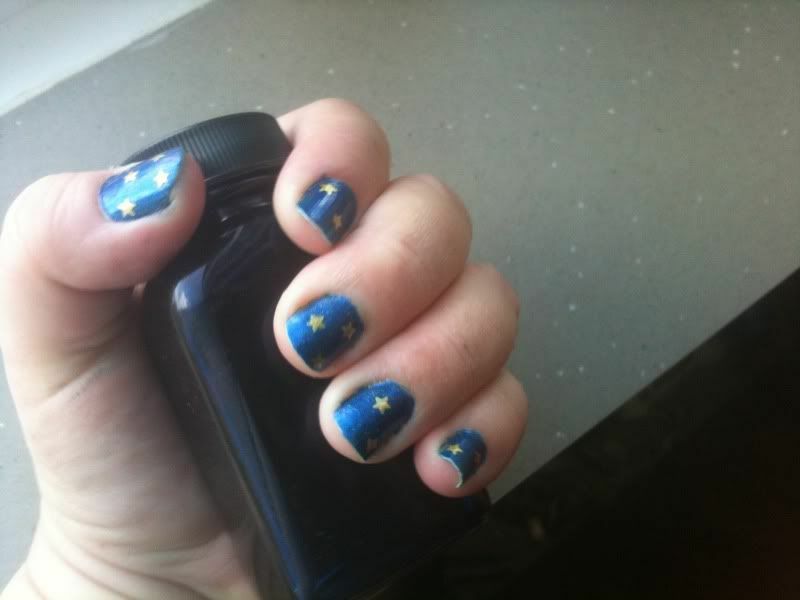 I normally don't change polish quite this frequently, but the boy and I are going on a day trip to Gettysburg tomorrow, so I thought I'd do a design in honor of the Wepwawet, the Opener of the Ways. 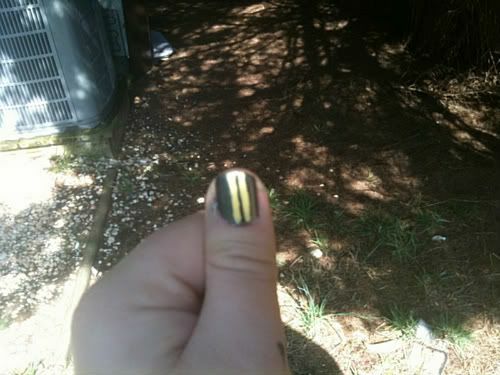 I used the same shimmery black as I used for the tips yesterday. I just got it and I love it -- the camera really can't capture the depth of the shimmer. In this context, it made me think of the sparkly sheen of asphalt. Maybe the road lines are a little literal, but I'm cheesy like that. This is a silly blog based on a silly idea, but I figured someone else might find my silliness entertaining. The idea: Since I have a disturbingly large (and growing) nail polish collection as well as a love of ancient Egypt, I would start a nail blog that features manicures with an Egyptian deity theme. I will use both the Egyptian names of the deities as well as the more commonly-known Hellenized names for clarity. 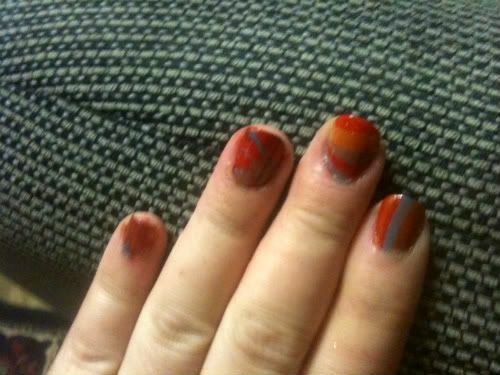 I am not a nail professional, just a nerd who likes painting her nails several times a week as a form of stress relief. Still with me? All right. Apologies for this picture -- I need a new charger for my real camera, so I used my phone. 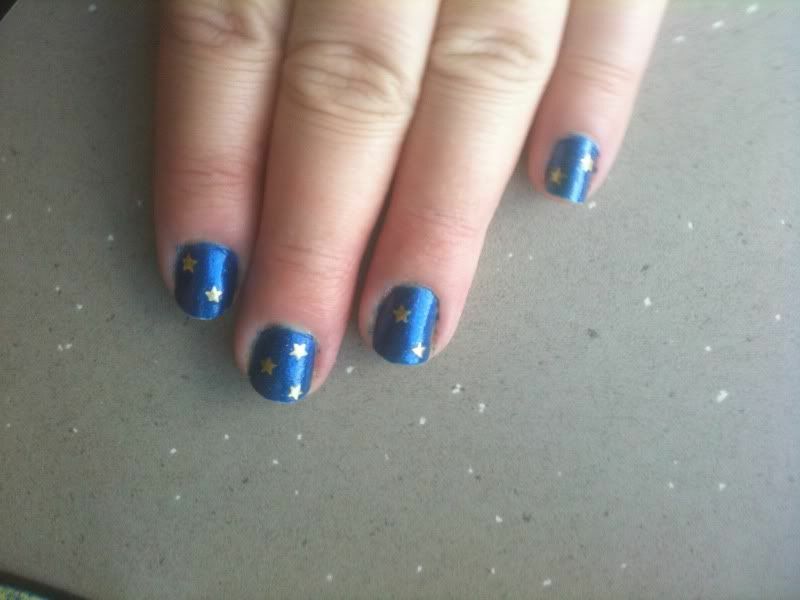 Additionally, I wasn't planning to take pictures of this at first, so there's some mess around the cuticle from my previous manicure. This design is inspired by Wesir (Osiris). 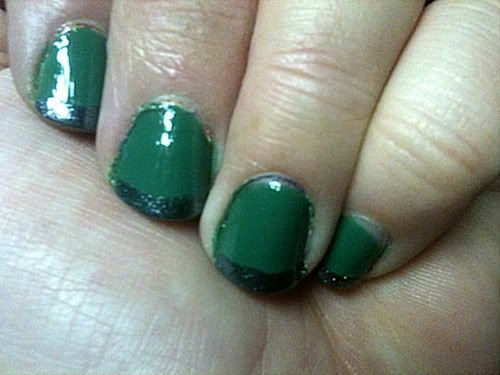 I paired a creamy greyish green with a shimmery black. The picture doesn't really do the green justice -- it really is a lovely, gentle color without being dull or pastel. Overall, it's kind of a hopeful, regrowth kind of Wesir... very appropriate for this time of year. A colorful nerd who enjoys really old things, nail polish and juice.